If you plan to print invoices from QuickBooks 2015, you need to set up the invoice printer only once, but you need to specify a handful of general invoice-printing rules. These rules also apply to credit memos and purchase orders, by the way. Choose File→Printer Setup. From the Form Name drop-down list, select Invoice. QuickBooks displays the Printer Setup dialog box. Select the printer that you want to use to print invoices. Activate the Printer Name drop-down list to see the installed printers. Select the one that you want to use for printing invoices and purchase orders. (Optional) Select the printer type. Continuous: Your paper comes as one connected ream with perforated edges. Page-Oriented: Your paper is in single sheets. Select the type of invoice form. Select the option button that describes the type of form that you want to print on: Intuit Preprinted Forms, Blank Paper, or Letterhead. Then select the Do Not Print Lines around Each Field check box if you don’t like the nice little boxes that QuickBooks creates to separate each field. (Optional, but a really good idea … ) Print a test invoice on real invoice paper. Click the Align button. When QuickBooks displays the Align Printer dialog box, choose the type of invoice that you want to print from the list and then click OK. When QuickBooks displays the Fine Alignment dialog box, click the Print Sample button to tell QuickBooks to print a dummy invoice on whatever paper you’ve loaded in the invoice printer. The dummy invoice that QuickBooks prints gives you a chance to see what your invoices will look like. The invoice also has a set of alignment gridlines that prints over the Bill To text box. You can use these gridlines if you need to fine-align your printer. To fix any big alignment problems — like stuff printing in the wrong place — you need to adjust how the paper feeds into the printer. When you finally get the paper loaded as best you can, be sure to note exactly how you have it loaded. You need to have the printer and paper set up the same way every time you print. 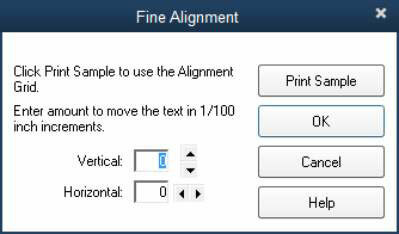 For minor (but nonetheless annoying) alignment problems, use the Fine Alignment dialog box’s Vertical and Horizontal boxes to adjust the form’s alignment. Then print another sample invoice. Go ahead and experiment a bit. You need to fine-tune the printing of the invoice form only once. Click OK in the Fine Alignment dialog box when you finish, and QuickBooks redisplays the Printer Setup dialog box. 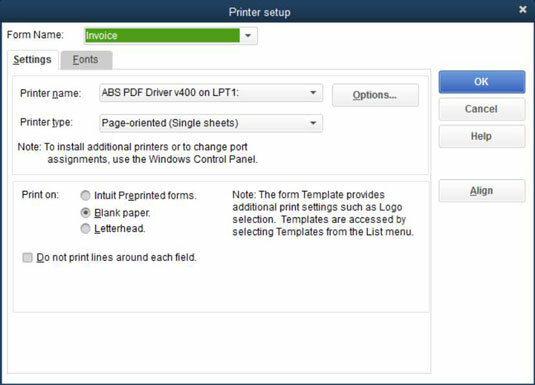 Clicking the Options button in the Printer Setup dialog box opens the selected printer’s Windows printer setup information, where you can do such things as specify quality settings or print order. If you’re the curious type or accidentally click it and then have questions about what you see, refer either to your Windows user’s guide or the printer’s user’s guide. Save your printer settings stuff. After you finish fiddling with all the Printer Setup dialog box settings, click OK to save your changes. You can print invoices and credit memos one at a time or in a batch. How you print them makes no difference to QuickBooks. Pick whatever way seems to fit your style the best.